With over 4,500 colleges and universities across the country, finding the perfect fit based on academic needs, learning styles and personality can be stressful. To make the process even more difficult, once a student narrows down the list, most colleges and universities have widely diverging views on what makes an ideal candidate. And unfortunately, students are asked to undergo this confusion and stress during a time that is already chaotic for most teens. 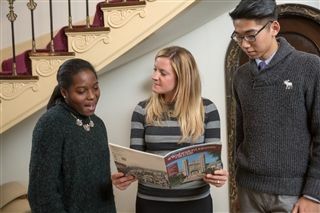 To help streamline the process and reduce student anxiety, Moravian Academy’s College Counseling Department created a four-year college program that allows students and their families break down the process into manageable pieces while also helping students discover who they are so they can make more informed decisions on which institutions will best meet their educational needs. The emphasis in ninth and tenth grades is on the process and personal growth. Then, during junior year, students begin to meet regularly with advisors to discuss a range of topics related to their individual goals. 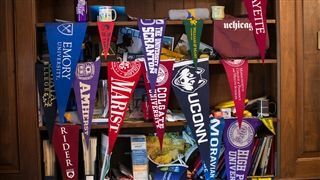 While some students see choosing a college as a rite of passage that they’ve long been planning, others may only slowly waken to it as they familiarize themselves with the academic and social expectations that change between their freshman and senior years. Technological advances continue to change the admissions process from year to year, providing online access to more tools than ever - which can help the process while simultaneously making it more confusing. It used to be that college view books were the chief marketing piece for college consideration. Now, families get bombarded with a torrent of information that may be beyond their capacity to absorb at one time. As students move into their junior year and begin the application process, they meet weekly in small groups to address each step and schedule full family appointments with their counselors. What is imperative, however, is that they develop a level of autonomy in how they approach their decision making. It’s also helpful to educate parents on how the process unfolds. At Moravian Academy, parents join the process during junior year. Each family schedules a meeting with their child and the college counselors review what colleges are looking for in an application, the student’s academic record, a standardized testing plan, and how they can continue to build on accomplishments. Part of the discussion also deals with what is driving that student’s search in terms of location, size of the school, and what kind of learning environment they picture themselves in. Their counselors create a tiered preliminary college list and walk them through why they chose particular schools and what the tiers mean regarding selectivity. Then parents and students have the opportunity to ask questions. “We talk them through a timeline in terms of what’s going to happen next, and we always promise support through the process,” says Dubreuil. There is also family programming throughout the decision-making process that includes guest speakers and panel discussions. “Earlier in the fall, we invited representatives from the University of Pennsylvania, Johns Hopkins University Lafayette College, Purdue University, Bucknell University, and Dickinson College. We asked them a variety of questions about hot topics in college admissions, and then families had the opportunity to ask questions,” says Shaughnessy. That event was followed by a college financial aid information night in early October. 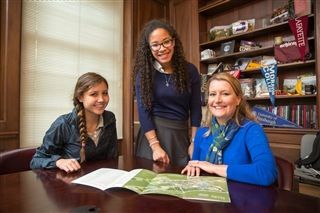 The process of college counseling at Moravian is designed to keep students organized and to continue developmentally relevant conversations about what they should be thinking about as their Upper School years progress. But more than anything, it’s about assisting students as they navigate a critical time in their lives and start to learn how to tell their own story.